Winter! Ahem, I mean, the holidays! So, I started working on another type of pattern, but I got this far and thought… Gosh darnit! I made a snowflake! A pattern was born. So here you are, a pretty, simple, quick to work up project for the holidays. This is one of those brain dead projects that, once you make one… for the pattern end of it, you will be whipping these out in no time. Several in an hour, in fact! My quickest workup of one of these was 12 minutes. That was after making about 3 of them. The other 3 were around 15 minutes. Let’s just say this project will give you a quick brain break from the big afghan you’re making, or all of the orders you have to fill…. and, well, it’s pretty! Make them for tree ornaments, pull out your cotton and work up a few snowflake coasters to fest up the home, grab your crochet thread and work up some pretty snowflake pins for your friends at the office (that idea was given to me by a dear friend and one of my co-admin’s Jeri!). So many different things you can do! Let’s see what creatives you come up with! Let’s make a snowflake! copies of this pattern instead, please refer others to YarnWars.com website to pick up their own free copy. tab of our YarnWars Facebook group. – Yarn- I used in video: Paton metallic silver. Use your own choice of yarn. – G hook was used in video. Use suggested hook on yarn label for other yarn types. 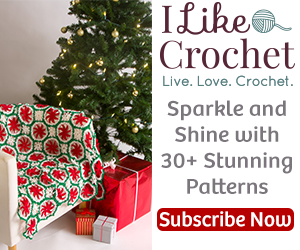 – Sc – Single crochet. – Dc – Double crochet. Begin by creating a magic circle (or ch 4 & join to 1st chain made with sl st). ** for each ch 3 space in round. Join into 1st dc made in round. of the chain up made in the beginning, with sl st.
up to end this round. Note: It is not necessary to ch 1 at end of this round. your house, from the tree to the walls to the ceiling! They are sooooo fast to work up. took me 12 minutes, and that was messing with my yarn to unwind! That quick! several of these in under an hour. Facebook group and tag me (Colleen Hays); I will do my very best to help! Perfect pattern for the holiday season! Thanks for posting!